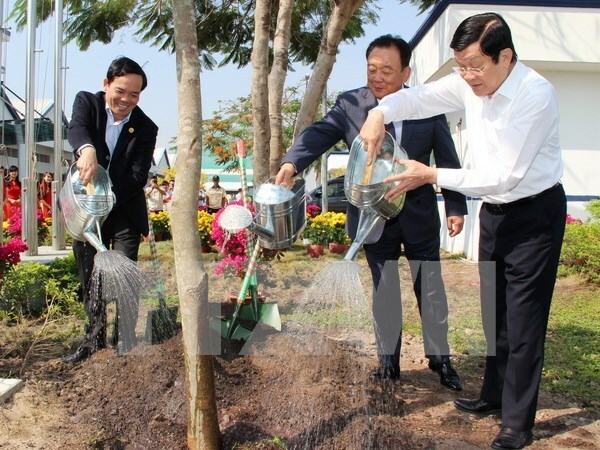 Tuyen Quang (VNA) – President Truong Tan Sang on February 15 beat the drum to kick off the Tree Planting Festival 2016 in memory of late President Ho Chi Minh. The launching ceremony was held in Hoang Khai commune, Yen Son district, northern Tuyen Quang province which has worked hard to grow and protect forests over the past years. Last year, Vietnam planted 246,500 hectares of forest and involved people in management of about 6.7 million hectares of forest, Minister of Agriculture and Rural Development Cao Duc Phat said at the event. The number of violations of the Law on Forest Protection and Development was reduced by 15 percent and losses caused by deforestation fell 22 percent from 2014, Phat noted. Meanwhile, exports of forestry products hit over 7.2 billion USD in 2015, a year-on-year increase of 10.2 percent, the minister added. Speaking at the ceremony, President Truong Tan Sang hailed the Tree Planting Festival as a fine tradition of Vietnam on the first days of the Lunar New Year, contributing to environment protection and socio-economic development. The president called on local authority and residents to join hands in the tree planting campaign and have a better awareness of forest protection and deforestation prevention.